How our preconceptions of viruses as nasty things may have thwarted our knowledge of the long list of positive interactions humans have with these microbes. How evolution changed us from furry creatures into lean, mean, skin-covered, sweating machines. And how we can now take pictures and make movies of atoms. Actual atoms. 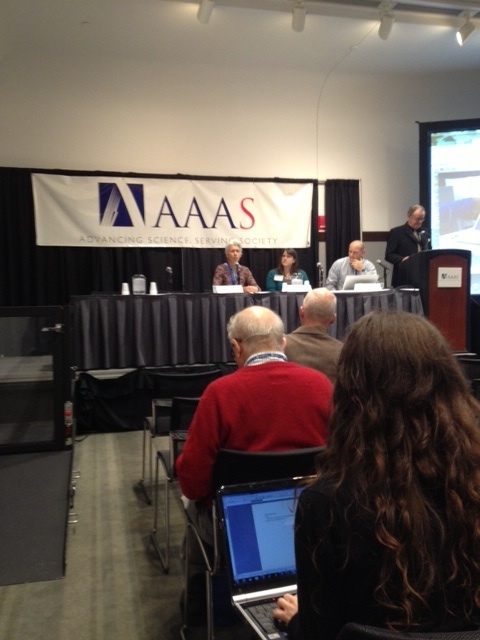 Dr. Jablonski addresses media questions at AAAS news briefing. One thing I did not learn is that I am not a great photographer. I have known that for a long time. In fact, if you couple my lack of photographic skills with my out-of-focus iPhone camera, the pictures of the atom have finer resolutions and were much clearer.